Get excited, Justice League Unlimited fans! Then get slightly less excited. Now get a little more excited, but not so excited that you open up your fragile heart to any cartoon-related disappointment, just in case. We’ll take this slow, just so everyone can follow that emotional path correctly. According to Variety, the Internet video distributors at Machinima—the people behind Redbox staple Halo 4: Forward Unto Dawn and that grim and gritty version of Mortal Kombat—have secured the rights to Justice League: Gods And Monsters Chronicles, a new animated miniseries starring DC’s famous super-team. Variety says the series will be set in “a newly conceived reality in the DC universe where Justice League members Superman, Batman, and Wonder Woman are much darker versions of the superheroes that people know,” which DC fans will recognize as an idea that has never ever been done before. Here comes the “a little more excited” part, though: The series will be based on Justice League: Gods And Monsters, a new animated DC film from executive producer—and Batman: The Animated Series mastermind—Bruce Timm. So, if we were to put the most positive spin on this we possibly could, we’d say it’s like Bruce Timm is making a new Justice League cartoon! It might not really be that, but not even darker version of the superheroes that people know can stop us from pretending that it is. 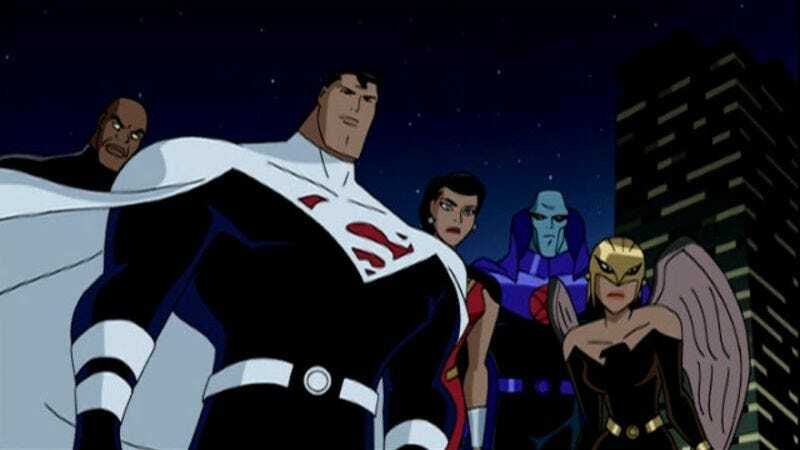 Justice League: Gods And Monsters Chronicles—which is a title only Superman can say without having to take a breath in the middle—will premiere online in spring of 2015, with the movie arriving on DVD at some point after that.